More than 7 million people live in this verdant state where the dogwoods bloom like nowhere else in the country. Yet gardening in Virginia’s diverse climates and soil conditions can prove to be a challenge. Master gardener Donna Williamson’s down-to-earth approach cuts through the nonsense and presents helpful information that is proven to work with Virginia’s specific soil and climatic concerns. The Virginia Gardener’s Companion helps gardeners stay close to nature and demonstrates the basic principles of gardening so that they can make better choices, have more success, and find more joy in their little patch of paradise. Williamson also explains how the low-maintenance approach suits most gardeners today, given the demands on our time that may otherwise crowd gardening from our lives. 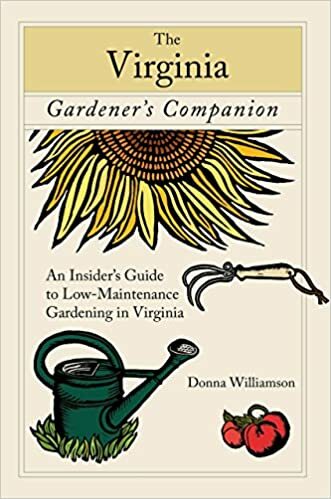 Hands-on tips appear throughout the book, and the resources chapter is chock-full of state-specific resources that will guide the reader to the best and most current information available for the Virginia gardener. The Virginia Gardener’s Companion includes advice for everyone, from beginner to the most advanced green thumb. Author Donna Williamson is a master gardener, garden designer, and owner of Donna Williamson Fine Gardening. She has taught gardening and design classes at the State Arboretum of Virginia, Oatlands in Leesburg, and Shenandoah University. The founder and editor of Grandiflora Mid-Atlantic Gardening magazine, Williamson writes on gardening topics for publications including Virginia’s Loudoun magazine. This notebook is about your garden and your journey through the seasons. It can be used for many years and in a multitude of combinations & configurations.